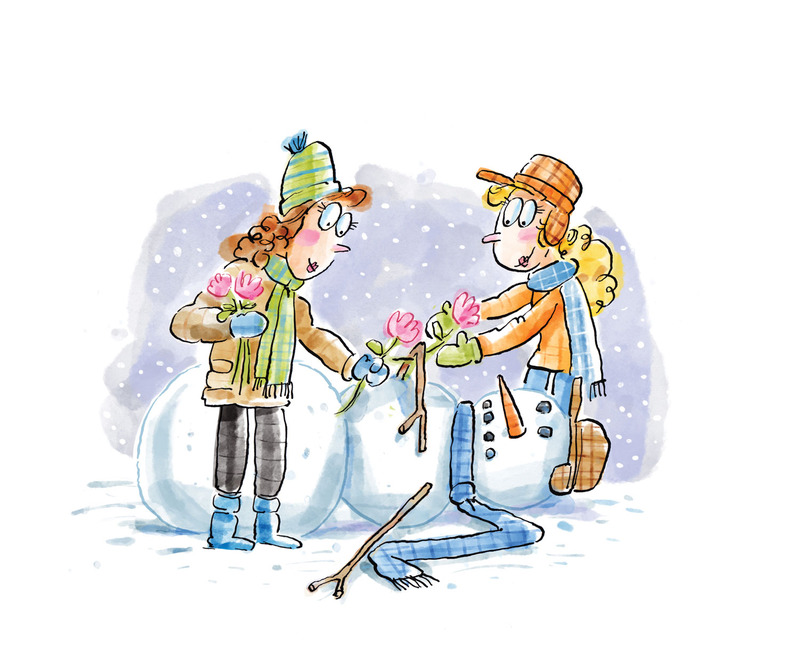 Students navigate challenges and embrace opportunities offered by winter’s white companion. By Trevor J. Fitzgerald (BS ’12, MISM ’12) | Long Beach, Calif.
During my sophomore year, I had extensive jaw surgery, but because the procedure was not entirely successful, a follow-up surgery was scheduled during the middle of a snowy winter. A few nights before the follow-up, Shelley Vrooman (BS ’09), my then fiancé, and I joined our singles ward at a sledding activity. Since my oral surgeon had given me strict instructions to avoid any physical activity, I watched for a while. But then I grabbed a sled and snuck away from the group to a dark part of the hill. 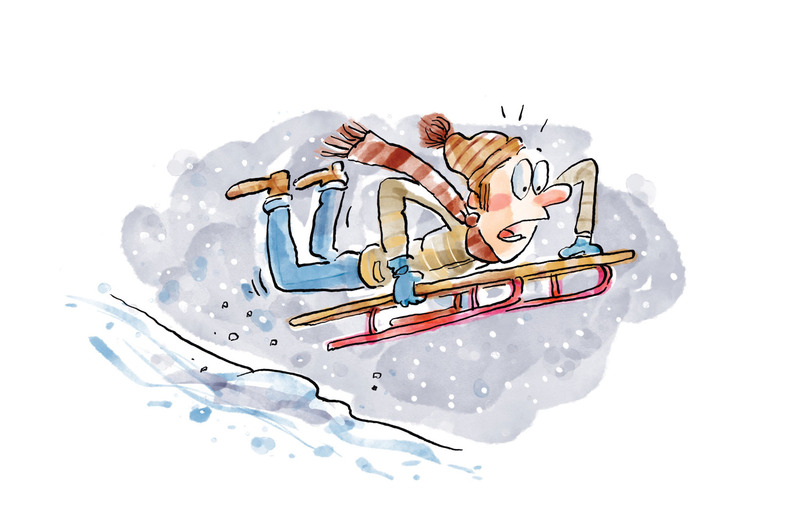 I jumped on the sled, only to realize I was on slick ice. I flew down the hillside, hit an unseen jump at the bottom, and launched into the air. When I smacked the icy ground, I came down hard—on my jaw—and heard a loud pop. The surgeon inspected my jaw the next morning and was shocked to discover that my mouth had perfectly realigned. I would not need any more surgeries! He declared it a miraculous recovery—and I never told him what really happened. By Michael T. Bingham (BA ’83) | Lakeland, Fla.
For my insect life class freshman year, we were required to collect, identify, and mount a number of insects. Our instructor urged us to not delay our collecting because once the temperature drops, the insect pickings become slim. After a couple of inches of snow fell one morning, I saw a dead wasp lying on top of the snow. I picked it up, silently thanked Heavenly Father for this morsel of insect manna, and carefully carried it in the palm of my hand back to the dorm. Living on the seventh floor of Deseret Towers was great for the view of campus, but the elevator ride was long. This time the crowded ride to the top got a little more exciting when the wasp suddenly flew out of my hand. When the door opened, five of us leap-frogged over each other to get out and the wasp disappeared down the hallway. In the next class my instructor explained the principle of insect chill coma. My date and I entered Movies 8 during a blasting snowstorm. After the film, we walked out to complete white stillness. Tree limbs were heavy and the street below was covered under the winter blanket. The freshly fallen snow glistened in the light. It was breathtaking. As we pulled out of the parking lot, my date opened his sunroof so we could get a better view—not taking into account the foot of snow that had accumulated atop the car while we were in the movie. I was instantly covered in cold, cold snow. We caught our breath, wiped our lids, and peered wide-eyed at each other. After a second, we simultaneously burst. Peals of laughter lasted for the rest of the date, which, honestly, wasn’t that long considering our soggy state. I rounded the corner to my apartment after a particularly long date with my studies. My roommate was lingering in the doorway with her boyfriend. It was late, the snow was falling, and it was Valentine’s Day. Add that to my knowledge that he had not kissed her yet, and anyone could have seen where the two were headed. I slunk back around the corner and seated myself on the steps, so as not to ruin the moment. I quietly pulled out a book, congratulating myself on being such a good roommate. Twenty minutes later, I had moved on to cursing the timidity that had seized the boy, as the two of them still stood in the doorway talking. A group of our neighbors started to pass by me. One of them asked, “Why aren’t you in your—oh.” She looked in the direction of my apartment and saw my dilemma. “Aw, you poor little snow-covered waif,” another one said. “Should we adopt you for a little while?” I nodded and followed them to their apartment, where I waited 15 more minutes before the way was clear. I managed to pass all of my finals. After an agonizing four months, another miracle materialized: the last bit of snow melted and there were my keys—right outside my dorm. They’re important life lessons: Hoard quarters. Stake out a machine on Wednesday at 10 a.m., because you’ll have no chance Saturday afternoon. Bring homework, but only the kind you can do with a rhythmic rumbling soundtrack. And of course, don’t let the cute stranger studying on an overturned laundry basket leave before getting at least a name. Whether from your dorm dungeon or your over-warm but always-fragrant apartment-complex laundromat, we want your story. Deadline: March 4.